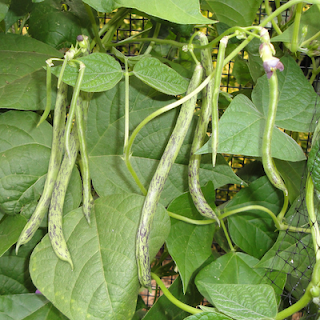 Besides growing my usual must-haves, which are snap beans such as Emerite, Royal Burgundy, and runner beans to dry for winter cooking, I grew beans sent to me through Rancho Gordo's Bean Buddies project to trial in my garden this summer. Rancho Gordo initiated this project with gardeners in order to get feedback on the germination, growth, and eating qualities of selected beans. Shown in the photo above, the seeds I received were: Rattlesnake, Madeira, Jackson Wonder (a lima) and Florida Butter. 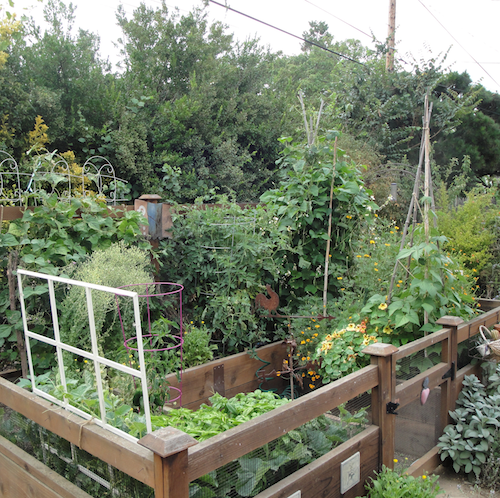 I planted all of them, and all grew except the Florida Butter beans (I think I planted too early - not warm enough?). My summer garden is waning now and I'm collecting all the beans seeds that I can. Since I received very few seeds I figured I would expand them to plant next year and then test them in the kitchen. My dried seeds are in the photo below. I only grew two Madeira bean plants. I had five seeds that survived the shipping, and planted three. 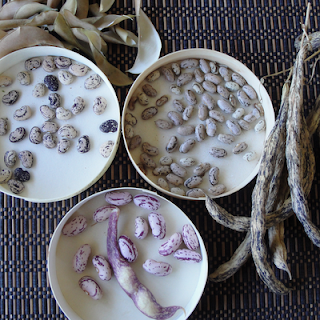 I like to keep a couple of beans to compare my own dried seeds with. 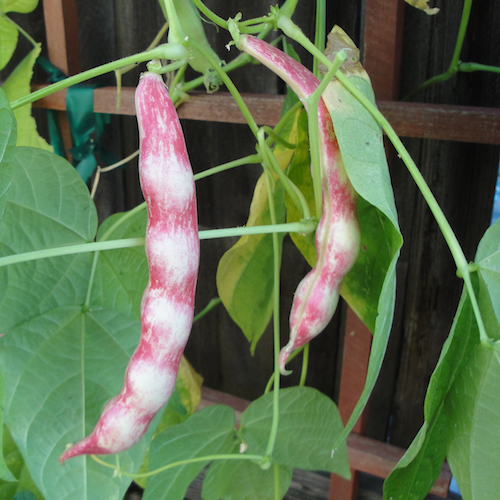 Madeira beans have pretty cranberry swirls and the same rosy color on the pod; I'll bet it's a tasty variety for cooking. I didn't eat any of the Jackson Wonder either as I had only a few plants. This one is a bush lima with lovely seeds; I'll save these and also do an expanded planting next summer. The Rattlesnake beans are fantastic - wow. I ate a few as snap beans, but I saved most of the harvest for seeds. They have great rich flavor as a snap bean and are incredibly tender. 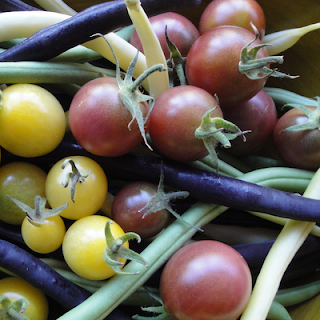 They do have a bit of a string, unlike the beans I usually grow to eat fresh, such as Emerite. But they're so good it's worth bothering with the string. I won't have enough to eat as dry beans, but perhaps next season! 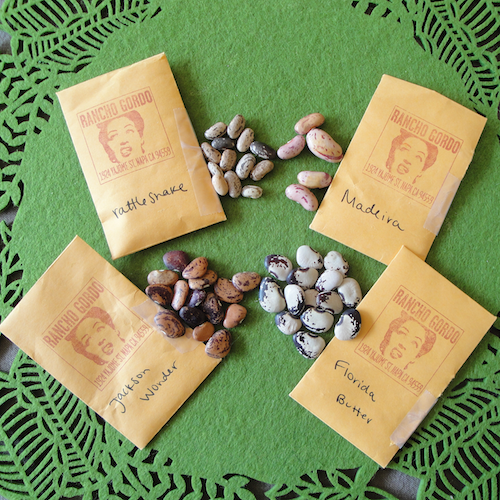 The Bean Buddies project is a generous undertaking by the folks at Rancho Gordo. I loved getting a selection of beans in the mail; it was like getting a special present. I've never grown any of these before so it was a nice addition to my summer garden and I'm thrilled to discover new beans to grow and enjoy. I love sharing my passion for gardening and hope you've found bits of encouragement, inspiration, or simply enjoyed a beautiful image in my posts now and again. 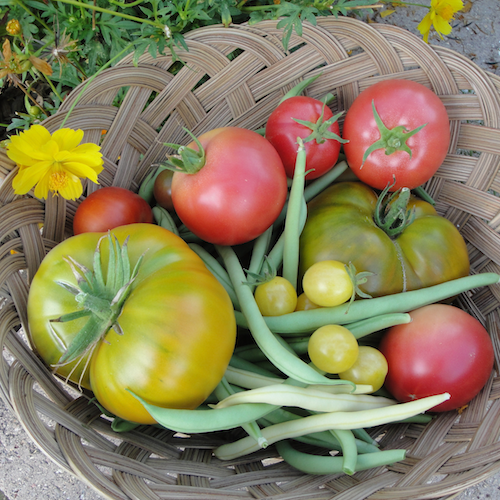 The Russian Malakhitovaya Shkatulka green tomato pictured above, was the star of our garden this summer, for both flavor and beauty. Growing cherry tomatoes are a must every summer. 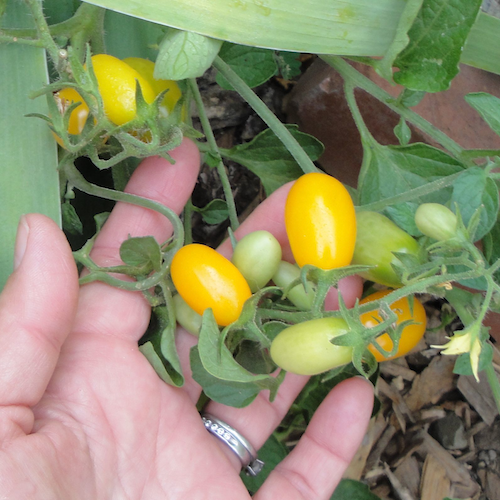 Cherry tomatoes usually ripen early and are abundantly productive. If my larger-sized tomatoes fail, I can count on having beautiful cherries and not miss out on summer tomatoes entirely. 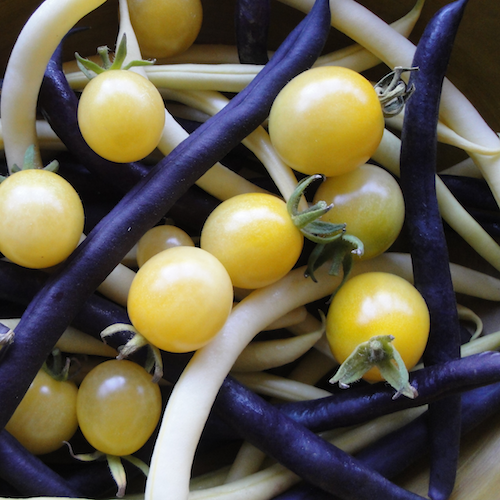 I've discovered really gorgeous cherry tomatoes shown in these photos: Black Cherry and Lemon Drop; I think you can tell which is which! Gardening is full of interesting and fun surprises: this is the second summer in a row that a bright yellow, jelly-bean shaped tomato (below) has seeded itself in my garden. This time it grew among a patch of irises in a dry area. I've never grown this variety and we've never bought any tomatoes like this one. Perhaps it grew out from a crossed tomato? This time I'm saving the seeds, as it has good flavor and production. Another one of my favorite summer surprises this year is the delicately colored nasturtium that volunteered to grow in a vegetable bed, apparently enjoying the company of Romano beans and French marigolds. Nasturtiums easily self seed and I've planted a few different types in the garden over the years, but I don't recall this one. The flowers start off pale yellow with red blotches then develop a rosy blush as they age. I'll save the seeds but I don't know if they will grew true next year- it's part of my experimental approach to gardening! 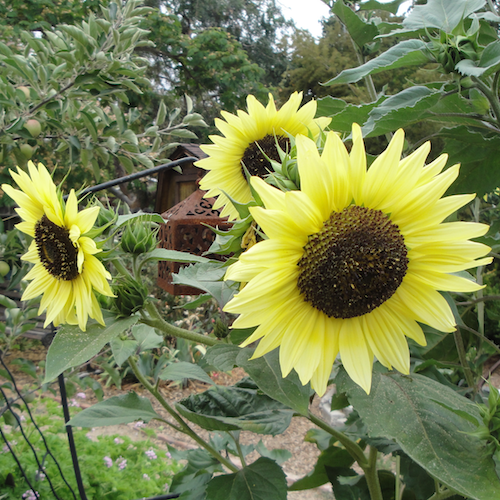 Lemon Queen sunflowers are showy and brighten up the garden. I grew them in my front and back yards this summer. Bees love this particular sunflower and birds enjoy the plentiful seeds from the smallish flower heads after they have dried. Did you know that some sunflowers are bred to not produce pollen? It's so they won't drop "messy"pollen when they are used as cut flowers indoors. So if you hope to share them with bees in your garden, make sure they aren't the hybridized no-pollen type. 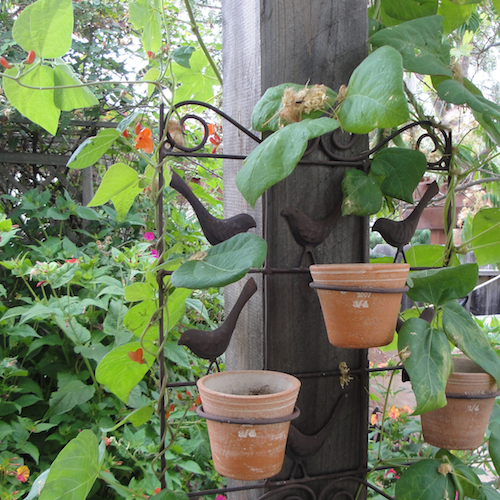 Runner beans are growing in several spots throughout my garden. 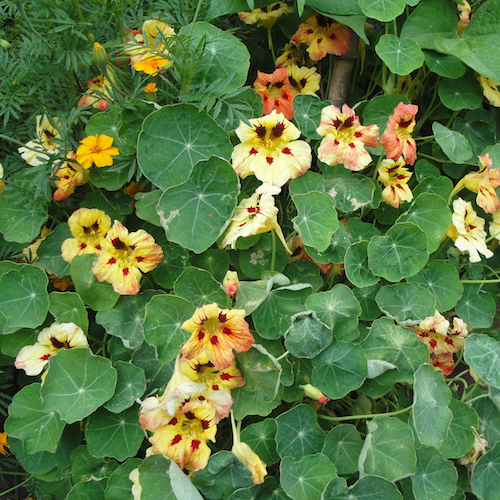 They are ornamental as well as a nutritious edible. Runner beans are hardy, have pretty flowers in a range of colors and can climb up a trellis 10 to 12 feet high. 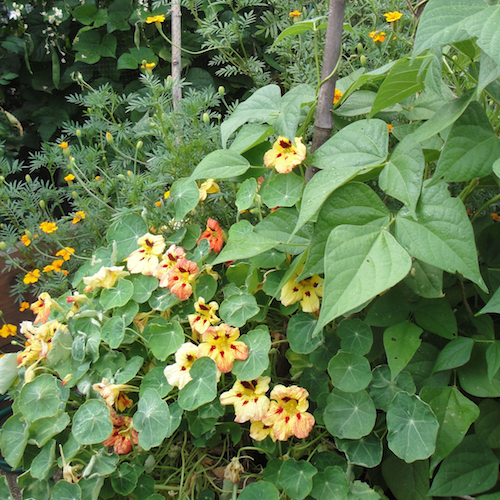 The flowers and pods are edible, and you can save the dried beans to cook during the winter. Plus they will happily grow back in the spring from rhizomes left in the ground after they have died back with the first frosts of winter. I hope you too have enjoyed the bountiful gifts of summer, and if you aren't able to have your own garden, this post is dedicated to you!